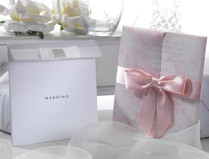 Wedding stationery is one of the most important aspects of your big day. From save the date cards to give your guests a taste of what they can expect from your celebrations, to matching RSVP reply cards, order of service, wedding breakfast menus or place cards. 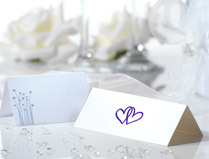 At Bride & Groom, we pride ourselves on taking care of all your wedding stationery needs. Research is the most important part of planning your wedding stationery as you can decide colours/styles ahead of your wedding. Once you've found a design that catches your eye, click on the image to find out more information. Matching stationery items that are available in that range are then shown below. We have tried to ensure that all items within a range are displayed, but if you have any questions just get in touch. 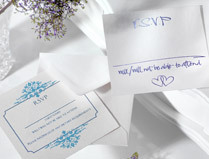 Wedding stationery is a very versatile part of your wedding. 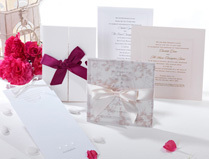 Quite often, cards that are available as part of a range can be used as a menu, an order of service, or even as thank you cards. 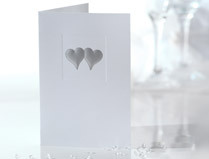 Our Wedding Stationery comes in many designs, shapes and sizes! 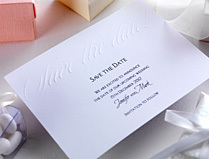 With over 900 wedding stationery items, many ranges boast complete sets of save the dates and invitations through to thank you cards. Some of our most popular items for 2019 are Wooden Save the Date magnets! These fun and useful reminders can be personalised with images and writing to give you a truly 'one of a kind' design.